Why is it that when Forrester polled global enterprises, 83% of energy respondents and 74% of respondents in manufacturing put digital transformation at the top of their business priorities? It’s because business and IT decision makers in both sectors see digital transformation as the path to growth and innovation. In the case of energy, an era of pricing pressures along with heightened expectations for modernized power management and production optimization is upending the sector. While shortened product lifecycles and global competition are just some of the challenges manufacturers face. To counter these dynamics, companies in these sectors are focusing on getting more out of what they already have – gaining efficiencies in existing operations and optimizing asset and infrastructure maintenance – as they evolve their business models to take advantage of new opportunities. And that’s where digital transformation comes in. The industrial sector at large is increasingly focused on IoT devices as their environments become more interconnected. These sensors and smart devices deliver valuable data that needs to be securely consumed and analyzed by leaders to move their business forward. In manufacturing, these devices interact with and control machinery like lathes, robots, and automated assembly systems. In the energy sector they interact with electric generators, transformers, and switches and equipment used in oil and gas drilling, transport, and refining. Traditionally, the operational technology (OT) components controlling the physical processes at the core of these organizations have been completely separate from their IT counterparts that handle the flow of business information. But as OT assets increasingly collect data that’s critical in today’s decision making processes, IT and OT are converging. Companies need access to all available data to monitor changes occurring in their business environment, to optimize their customer experiences and operations, and to capture new market opportunities. Here are just three ways in which energy companies and manufacturers can use this data to their advantage. 1. Predictive Maintenance. Keeping remote facilities up and running typically requires sending trucks and technicians on the road, which is a costly proposition. By getting data from previously isolated devices, these organizations can begin to predict when assets need servicing, upgrades, or replacement, thus significantly saving on operational overhead. Companies can get more life out of their considerable investment in long-lived assets, and increase their uptime by avoiding unplanned and costly breakdowns. 2. Production Optimization. By monitoring the power grid and gathering consumption data from businesses and consumers, utilities can see where and when energy demand fluctuates. They can make corrections to balance demand and production, predict peak usage times to avoid service disruptions, and develop new service offerings. For example, if a section of a city has high electric vehicle usage, offering additional charging stations and competitive pricing during off-peak periods can make power planning more efficient. Oil and gas firms can use data analysis to enhance oil-recovery techniques and reduce drilling costs. Permanent reservoir monitoring and advanced analytics, along with next-generation worker technologies like video-based collaboration, have translated into faster, safer, and more reliable energy production. 3. Innovation. Digital transformation also allows organizations to evaluate their business models with greater insight, and adapt or create entirely new business models quicker and more effectively. With better information about markets they serve and how consumer preferences are evolving, energy providers and manufacturers can make more informed decisions about where to invest – be it in new equipment, new processes, new plants, or in facility upgrades. 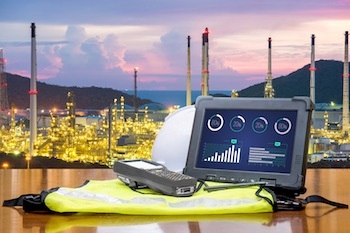 To capture all of these opportunities, energy and manufacturing companies must break down existing silos between IT and OT with secure, effective, and efficient connectivity. Smart sensors combined with edge and fog computing can collect and analyze data close to where it is generated, and deliver it to the business side of the organization. This lowers bandwidth requirements and infrastructure costs. Shifting computing power and applications to the edge allows a more agile response to changes in the business without the need to retool IT systems on the backend every time business models evolve. As companies build out the networks of tomorrow, they must do so with security as a fundamental component of their investments. Valuable information stored remotely and transmitted back to a corporate data center is a prime target for espionage, theft, and sabotage. In the Cisco 2017 Security Capabilities Benchmark Study, 36% of security professionals said that operations is the function most likely to be affected by a public breach. This means that the core systems supporting productivity—affecting all industries including manufacturing and energy—can slow down or even grind to a halt. Unfortunately, security has too often been relegated to the “security people” to handle. But in today’s hyper-connected, world cyber threats are pervasive and potentially impact every aspect of an organization. To support digital transformation, security protections must be tailored to fit the specific needs of OT and work in concert with IT security strategy. Security must be woven into core business processes and embedded into network, services, and device-level technologies. Organizations must also adopt proactive, real-time detection and monitoring capabilities against cyber threats so they can adequately respond to incidents, contain impacts to operations, and better plan for future investments. Proactive, well-planned security is the foundation to power-up digital transformation. It enables manufacturers and energy companies to be more innovative and more resilient, while gaining operational efficiencies, reducing costs, enhancing customer experiences, and, ultimately, beating out the competition.